Anti-corruption programmes, projects and campaigns have come to constitute an essential aspect of good governance promotion over the last two decades. 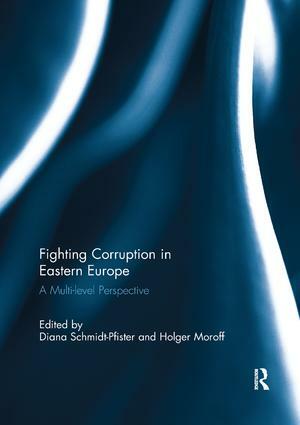 The post-communist countries in Eastern Europe have presented one of the first key targets of transnational anti-corruption efforts, and indeed most of these countries have shown an impressive record of respective measures. Yet path-breaking institutional and policy developments have not set in before the mid-2000s both at the international level and in most Eastern European countries. Are these the beginnings of a mutually synergetic success story? In order to answer this question, we need to better understand the complex interplay between the international and domestic domains in this policy field and geographic region. This book provides in-depth and comparative insights about this interplay, with a particular focus on the involvement of domestic social movements, governmental political machines and international legal mechanisms. We find that, on all three levels of analysis, political and material interests of relevant actors are complemented and at times contradicted by normative claims. Moreover, at the interfaces of the three levels, coincidental and spontaneous developments have largely outweighed systematic implementation and coordination of appropriate anti-corruption strategies. This book is based on a special issue of Global Crime. Diana Schmidt-Pfister is a researcher at the Centre of Excellence ‘Cultural Foundations of Integration’ at the University of Konstanz, Germany. Her research focuses on normative change at the nexus of governance and culture. Her book Transnational Advocacy on the Ground (Manchester University Press, 2010) assesses transnational anti-corruption promotion in Russia. Holger Moroff is DAAD professor of political science at the University of North Carolina in Chapel Hill. His research and publications focuse on comparative political corruption and the internationalization of anti-corruption regimes as well as on security theories and European integration.